The Daily Telegraph took time out last week from the search for honourable members in the UK’s House of Commons to post this upbeat article on the beneficial impact of the swine flu scare upon Jamaica’s tourist industry. This is a case where it pays to check the context and the data cited very carefully. Last year aircraft delivered tourists to the country rose 3.7% compared to 2007 – but this was more than offset by a decline a 7.7% in cruise passenger visits. And the start to the year has not been anything to cheer about either: whilst air passenger number in the first quarter rose modestly cruise arrivals fell off a cliff, down nearly 29%. Overall, more than 70,000 fewer tourists than Q1 last year. The trend is similar across the Caribbean. Last year was poor but not catastrophic. But this year – going on the incomplete data provided by the Caribbean Tourist Organisation (CTO) – appears for most destinations to have started very badly. 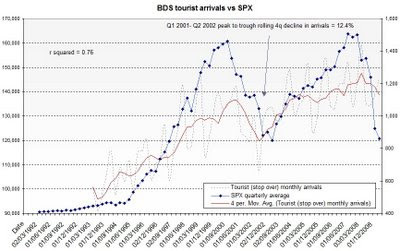 Most worryingly, there is not a single destination in this report from the CTO to which aircraft passenger arrivals in the first 3 months of the year are not decelerating at an increasing pace compared to 2008. What might the future hold? The rough and ready chart below tracking Barbados air arrivals against the S&P 500 is at once comforting and foreboding. In historical terms the industry is holding up – but the trend is far from encouraging.